Felix Valenzuela made his first gift to The University of Texas at El Paso in 2011 with the goal of transforming students’ lives by positively impacting their personal path of discovery and learning. Today his generous contributions are not only financial, but also have evolved into a robust set of activities fueled by his beliefs in raising the bar for upcoming generations. Felix serves as a board member for multiple university organizations such as the UTEP Alumni Association Board and the Stanlee & Gerald Rubin Center for the Visual Arts, where he recently helped fund an endowment benefiting artists and exhibitions. He additionally promotes young alumni involvement through campus networking events and seeks to encourage students to make an impact in the world. 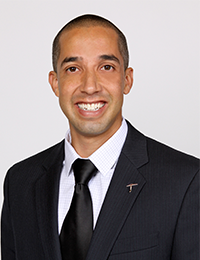 After earning a bachelor’s degree in political science at UTEP in 2003, Felix applied to Yale Law School (YLS), becoming the first UTEP graduate to attend this prestigious school, and earned a Juris Doctor degree in 2006. Felix then continued with his studies at the University of Notre Dame where he received a master’s degree in political science in 2010. Thanks to his outstanding academic achievements, he was selected for a clerkship with U.S. District Court Judge Philip Martinez. Although Felix continued his academic journey outside of El Paso, he stayed actively involved with UTEP. During the summers he volunteered at the Patricia and Paul Yetter Law School Preparation Institute (LSPI) program at UTEP and helped teach an online course with Dr. Robert Webking. After completing his studies he returned to El Paso and established his practice, Valenzuela Law Firm. Driven by his desire to give back to UTEP, he joined the UTEP Alumni Association Board in 2012. His role with the board shaped relationships that have developed into close friendships. “We all love UTEP and we realize how much the University has given to us by opening new paths of opportunity,” Felix says. Felix hopes to encourage students and young alumni to connect with professionals and grow their networks. Felix strongly believes that it is important for alumni to remain connected to their alma mater, because there are many areas where alums can make an impact in the lives of students. Give to the area that means the most to you.